赵振鲁, 刘甲星, 张跃环, 刘甜甜, 谭烨辉. 2019. ZHAO Zhen-Lu, LIU Jia-Xing, ZHANG Yue-Huan, LIU Tian-Tian, TAN Ye-Hui. 2019. Oceanologia et Limnologia Sinica, 50(2): 316-323. ZHAO Zhen-Lu, LIU Jia-Xing, ZHANG Yue-Huan, LIU Tian-Tian, TAN Ye-Hui. 2019. 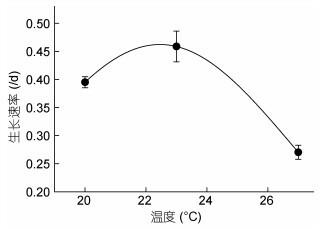 PHYSIOLOGICAL RESPONSES OF SYMBIODINIUM VORATUM TO TEMPERATURE AND LIGHT INTENSITY[J]. Oceanologia et Limnologia Sinica, 50(2): 316-323. Abstract: The genus Symbiodinium is an important primary producer in coral reef ecosystem and plays a key role in coral reef construction. 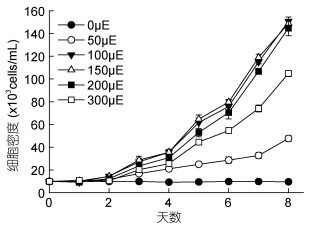 Yet knowledge of growth kinetics of these photosynthetic endosymbionts and their physiological responses is limited. 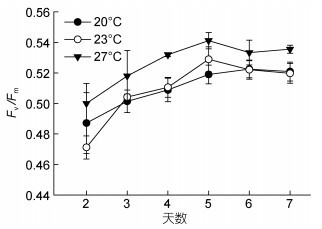 To study the physiological responses to temperature and light intensity of Symbiodinium, Symbiodinium voratum (Clade E) was cultured in laboratory. 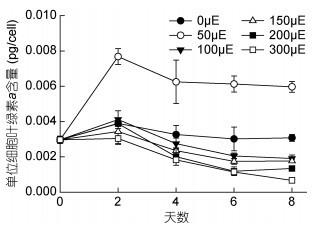 We established a tolerance model between temperature and specific growth rate based on experimental results and the Shelford's Law of Tolerance. The results show that the temperature tolerance model agreed with the Shelford's Law of Tolerance. 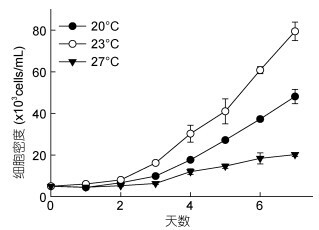 The optimum temperature and suitable temperature range of S. voratum growth were 22.56℃ and 16.72-28.40℃, respectively. 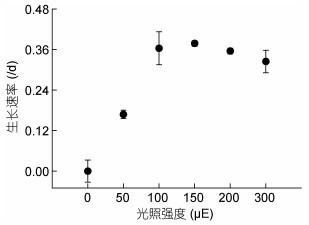 The accumulations of organic carbon and nitrogen peaked at 23℃, and Fv/Fm (the maximum quantum efficiency of PSⅡ photochemistry) at 27℃. 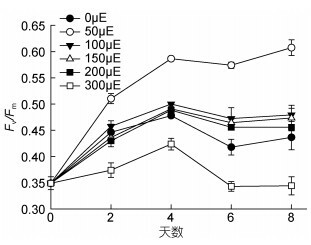 The suitable light intensity at 23℃ was 100-200μE, while at a lower light intensity, S. voratum could increase its chlorophyll a per cell and Fv/Fm in respond to the environmental change.